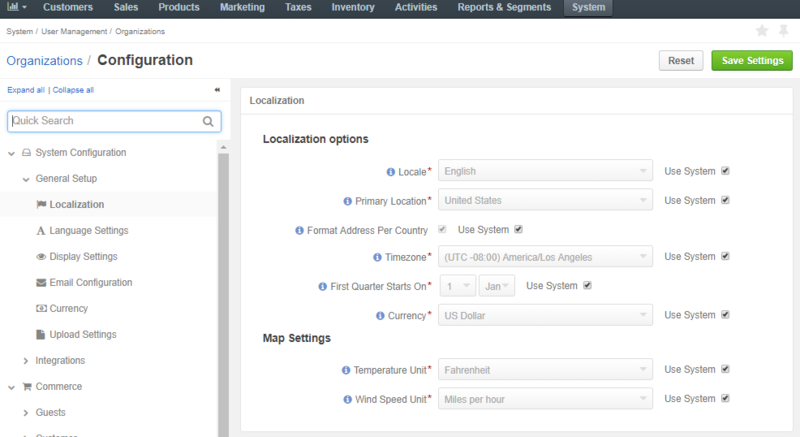 In the system configuration, you can define the localization options, such as system locale, primary location, address formatting method, system timezone, calendar year settings, temperature and wind speed units on the map. Furthermore, you can set the default language of the UI elements displayed in the storefront. Click the Translations icon next to the required content element to provide spelling for different languages. When the corresponding localization is enabled in the system configuration, the corresponding content translation is displayed in the storefront upon selecting this localisation. Click System > Configuration in the main menu. In the System Configuration menu to the left, expand General Setup and click Localization. For faster navigation between the configuration menu sections, use Quick Search. Define the address formatting to be applied. Otherwise, the Primary Location formatting will be applied. 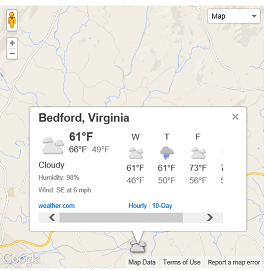 In the Map Settings, select the Temperature Unit and Wind Speed Unit to display the weather on the map. The default values are Fahrenheit and miles per hour (MPH). Select one or multiple enabled localizations from the list to support the translation of the storefront UI elements to the target language. The list is generated automatically based on the data preconfigured in the System > Localization > Localizations menu. Refer to the Localizations section for more details. 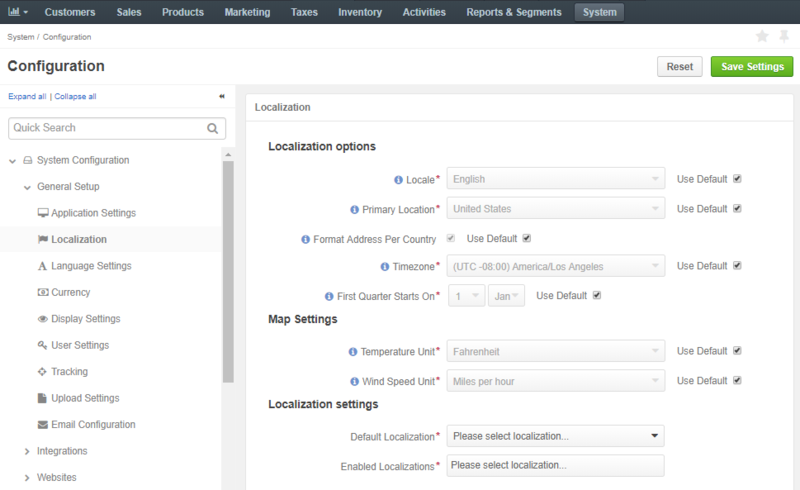 Select the default localization for the OroCommerce storefront. For the necessary organization, hover over the More Options menu to the right and click to start editing the configuration. Select System Configuration > General Setup > Localization in the menu to the left. Click Save to the save the settings. Navigate to System > Websites in the main menu. For the necessary website, hover over the More Options menu to the right and click to start editing the configuration. Select one or multiple enabled localizations for the website from the list to support the translation of the storefront UI elements to the target language. Select the default localization for the storefront of the website. For the necessary user, hover over the More Options menu to the right and click to start editing the configuration.